The Greek city-states are buffeted by the great powers of the region. 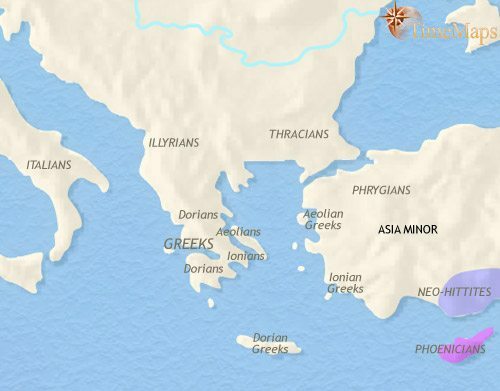 The first literate civilizations in European history flourish - the Minoan on Crete and the Mycenaean in Greece. The Minoan and Mycenaean civilizations have vanished, and Greece is now home to illiterate tribal societies. A great civilization has emerged in Greece, based on hundreds of small city-states. The Greek city-states and kingdoms have fallen under the power of Rome. The Greek cities are in decline, though their glorious past is still revered. The Balkans have been lost to Byzantine rule, and Slavs and Bulgars have settled the region. 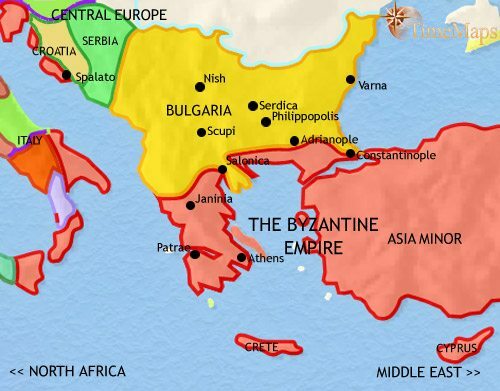 The Byzantines and the Bulgarians now compete for control of the Balkans. The rivalry between the Byzantine empire and the Bulgars has continued, only ending with the sack of Constantinople by the Fourth Crusade 1204. The Balkans are falling under the rule of the Ottoman Turks. The Balkans are now ruled by the Ottoman empire. 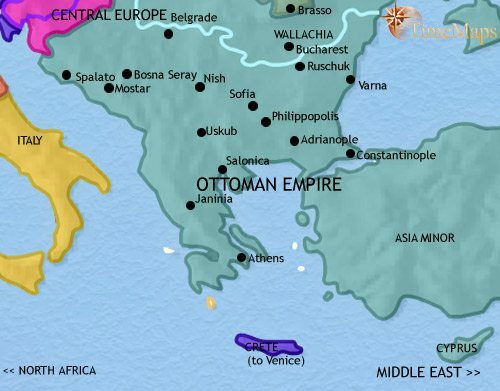 The Balkans remain under the rule of the Ottoman Turks. In the Balkans, national agitation against Ottoman rule is growing. Greece has won its independence from the Ottoman empire. 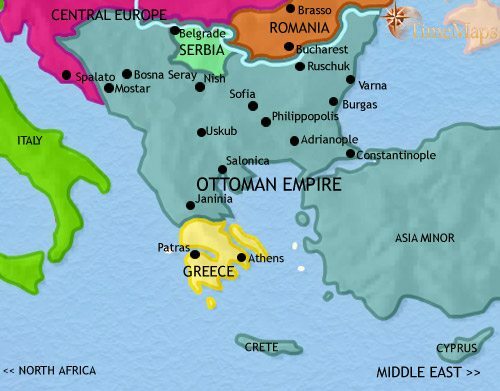 The Ottoman empire has been driven from most of Europe. Most of the Balkans is under communist rule. The Balkans have experienced bitter fighting between different ethnic groups. The years after 500 BCE saw the Greek city-states, under the leadership of Athens and Sparta, see off an attempt by the mighty Persian Empire to conquer them. This struggle opened two centuries in which the civilization of ancient Greece reached its brilliant cultural peak, culminating in the philosophical achievements of Socrates, Plato and Aristotle. These would lay much of the foundations for two thousand years of European thought. The cultural brilliance was accompanied by unceasing warfare, however, when led to the Greek city-states being eclipsed by new, larger powers. 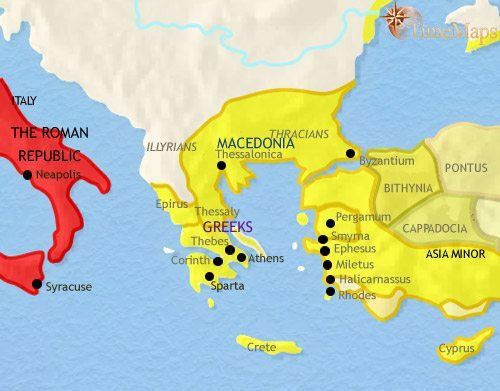 To the north of Greece, the kingdom of Macedonia rose to prominence under Philip II (reigned 359-336 BCE) and even more so under his son, Alexander the Great (reigned 336-323 BCE), under whom it briefly controlled one of the largest empires the world has yet seen. 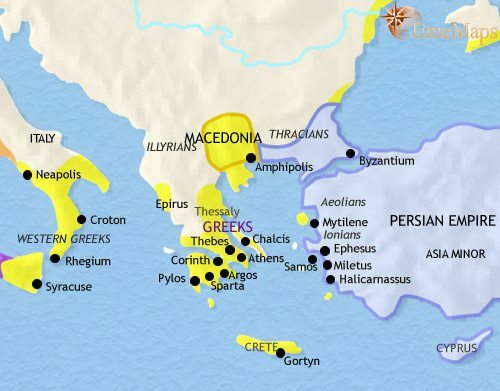 Since then Macedonia has played its part as one of the leading kingdoms of the region, along with Egypt and Syria. 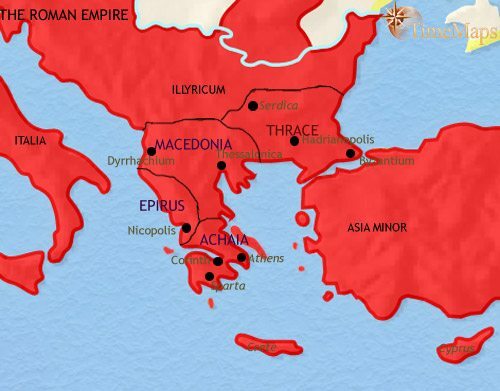 These kingdoms now overshadow the many small city-states of Greece. The classical age of ancient Greece is now over. However, Greek civilization continues to exert an enormous influence as the basis for the Hellenistic culture, which mingles Greek and local Asian/Egyptian elements and now stretches as far as India. On the island of Crete, the first civilization in European history – the Minoan – has been flourishing since around 2000 BCE. This is centred on some of the most sophisticated palace-complexes in the world at that time, distributed across the island. Of these, Knossos is the largest and most elaborate. Minoan Crete is a well-developed state with trading contacts throughout the eastern Mediterranean. 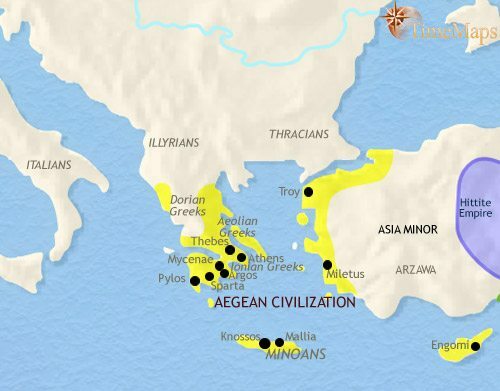 On the mainland of Greece and throughout the Aegean sea, another civilization, the Mycenaen, also flourishes. This consists of many small kingdoms, at Mycenae, Troy and other places famous in the epics of later Greeks, and ruled by warrior lords in their thick-walled palaces. The past few centuries have been tumultous ones for the inhabitants of Greece and the Aegean. The Minoan civilization of Crete came to an abrupt end about 1400 BC. The Mycenaean world continued to flourish, however, and southern Greece was the centre of a trade network which dominated the eastern Mediterranean. Mycenaean colonies appeared in southern Italy, Sicily, Asia Minor, and as far as Egypt and Palestine. After 1200 BCE, however, this civilization too fell into rapid decline, a process almost certainly connected to the movement of peoples from central Europe. Evidence of writing and other features of a more complex society vanished at this time. Thus ended the first ancient European civilizations. Greece is now home to small-scale, illiterate tribal societies. About now, however, the islands and coasts of Greece and the Aegean are starting to be visited by Phoenician merchants, from Syria. Through their influence, the Greeks will be reintroduced to literate civilization during the coming centuries. The region of Greece and the Aegean Sea is fragmented into steep mountains and valleys, as well as many small islands. Over the past centuries this has caused the populations here to form several hundred tiny city-states. The mountainous nature of the landscape has encouraged coastal Greek states to look out to sea. Many have sent out overseas colonies, so that Greek culture is now spread far and wide across the Mediterranean basin. In the centuries since 1000 BCE, contact with Phoenician traders from Syria has led to the introduction of the alphabet, amongst other things. Ancient Greece is now in the classical phase of its civilization. By 500 BCE, most Greek city-states have a republican form of government. Political life in these states is often unstable, and sometimes violent, but they allow a degree of freedom unknown in other lands. This has given rise to dramatic intellectual achievements which Ancient Greek civilization one of the great civilizations of world history. A few of these states have become the first democracies in history; the largest of these is Athens, soon to be one of the most famous centres of culture in the ancient world. The Greek city-states and the kingdom of Macedon were no match for the rising power of Rome, and by 146 BCE, after a series of wars, the Romans were in complete control of the region. The Roman occupation culminated in the destruction of the famous city of Corinth, since resurrected as a Roman colony by Julius Caesar. Roman governors now rule these provinces, but the Greek cities continue to elect their own magistrates and run their own affairs. The late Roman Republic saw a degree of oppression and misrule by several Roman governors, but now, under the firm rule of Octavian (soon to be called Augustus), the people of Greece know peace and good governance. The city of Athens has lost all its regional power, but it remains honoured by the Romans as a centre of culture and learning. Many wealthy Romans visit the city to complete their education. 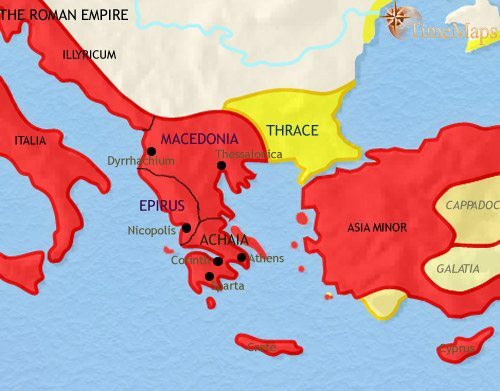 When the Romans annexed Macedonia and Greece, in 146 BCE, they gave the Thracians their own kingdom. Since then the Romans have had to get involved in the power struggles within the Thracian royal family from time to time, and will eventually be forced to annex the kingdom entirely. Under the Roman empire, Athens has continued to enjoy the prestige based on its magnificent cultural heritage, and is a university town to which young men flock from Rome and other parts of the empire for further education. As a whole, however, the province of Achaia has experienced economic decline over the past two centuries, possibly due to the degrading of the soil that has been a continual and gradual process over the centuries. 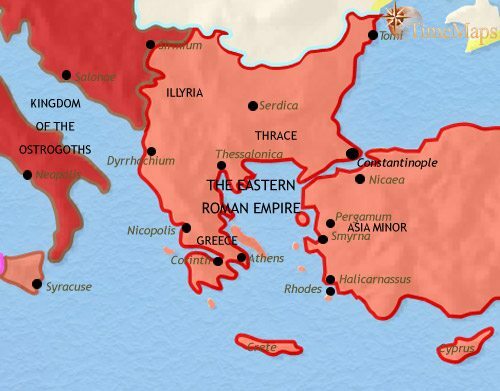 The Balkan provinces of the Roman empire are ruled from Constantinople, subject to the effective rule of the eastern Roman emperors. They have been spared much of the turmoil visited upon the western provinces. They certainly have not escaped completely – from time to time over the past three centuries armies of Visigoths, Huns and others have roamed to and fro across them. Nevertheless, the provinces have been spared the worst of the upheavals, and provincial life remains largely intact. Ancient cities continue to thrive, remaining centres of Roman-Greek civilization. Many of these cities are also now seats of Christian bishops, which in the eastern Roman empire is firmly under the control of the emperors in Constantinople. There is not that separation between secular and spiritual authority that is becoming increasingly marked in the west, where many Roman Christians find themselves under the rule of Arian Germans. Although they still regard themselves very much as members of the same faith, the eastern and western branches of the Church are already beginning to diverge. The Balkans remained under Roman (or, as we should now call it, Byzantine) rule until the time of the emperor Heraclius (610-641). At that time, a massive invasion, led by the Avar people from central Asia but composed mostly of their Slav allies, swept down to the very walls of Constantinople itself. Like so many other invaders, they failed to capture the great city, and were defeated by Heraclius. 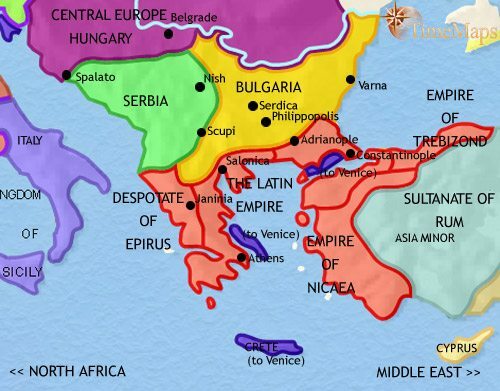 However, the Byzantines have been unable to reimpose their authority upon most of their old Balkan territories, except near the coast. In the meantime, the earlier populations have been swamped by Slav tribes, and city life has vanished from much of the region. In the 7th century a new people, the Bulgars, arrived from central Asia and established themselves just north of the Carpathian mountains, conquering the Slav tribes living there. They defeated a Byzantine army sent against them and were then recognized as a separate kingdom by the Byzantine emperor (681). Thereafter the Bulgars and Byzantines have been involved in continual hostilities, with Constantinople itself sometimes being under threat. However, it is the Byzantines who normally have the upper hand. 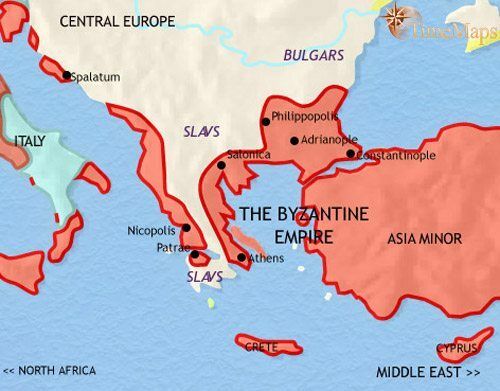 Byzantine forces have been able to gradually regain control over much of the territory lost to them by the Avar invasion of the 7th century, but they have continued to faced the threat from the Bulgars. In the 9th century a succession of Bulgar kings, having converted their people to Christianity, expanded their territory dramatically. However, more recently, internal instability and external attacks, from Magyars, Pechenegs, Byzantines and Russians, have weakend them. Caught up in the struggle between the Bulgars and the Byzantines, two Slav groups, the Serbs and the Croats, have both established independent principalities. The Croats have accepted the Catholic Church, and therefore looks westwards towards the Holy Roman Empire for political and spiritual aid. The Serbians adhere to the Orthodox Church, and look to the government in Constantinope for support. The struggle between the Byzantines and the Bulgars continued. However, the Byzantines, under their emperor Basil II, won a crushing victory at the battle of Belasitsa (1014), which led to the Byzantine conquest of Bulgaria and its absorption into their empire. In 1185 the Bulgars won their independence again. Then in 1204, the Byzantines suffered a catastrophe as the Christian soldiers of the Fourth Crusade sacked the Byzantine capital, Constantinople, and installed one of their leaders there as emperor. The Slav states of Croatia and Serbia have had varying fortunes. Croatia has become politically absorbed into Hungary, though the Croats retain their distinctive national laws and institutions, while Serbia has expanded greatly and is a strong, well-organized militaristic state. The northern Balkans were ravaged by the Mongols in the mid-13th century, with Hungary and Bulgaria being particularly hard hit. Then, in the 14th century, the Muslim power of the Ottoman Turks began spreading through the region. 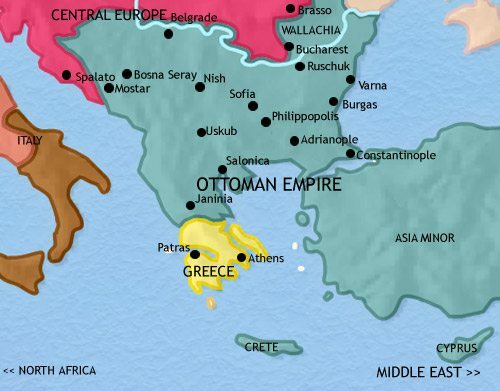 The Byzantines, who had regained their capital of Constantinople and partially restored their empire in the late 13th century, were the first to feel the Ottoman onslaught. 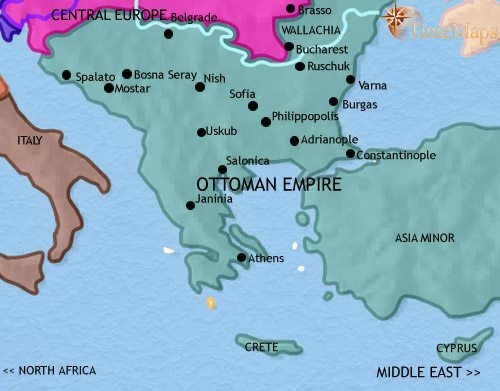 Although they retained Constantinople, they lost much territory to the Ottomans, who then turned north and conquered the Bulgarians and the Serbs. In this year, 1453, the Ottomans succeed in capturing Constantinople. They now pose an even graver threat to the independence of the remaining Christian states in the Balkans, and beyond. Article: Was the fall of Constantinople the greatest turning point in world history? After their capture of Constantinople in 1453, the Ottoman Turks progressively swallowed up all the Balkan lands and much of central Europe. The Christian population is allowed to practice its own religion in peace – except that, periodically, selected children are taken away to be converted to Islam and trained as Janissaries, the elite corps of the Ottoman army. Two areas are different from the rest. In Bosnia, a large part of the population has converted to Islam. This is probably due to the presence of the cities of Sarajevo and Mostar, which soon become virtually Muslim colonies, though both Catholic and Orthodox Christians continue to have a strong presence there. In Albania, fierce resistance to Ottoman rule led to the Ottomans settling thousands of Turkish soldiers, and their families, there. The Ottoman empire made two attempts to capture Vienna, the Hapsburg capital, in 1529 and 1683, but both failed. The latter seige was followed by the Ottoman frontier being rolled back by Austria and her allies. The Ottomans were able to stabilize the front and, later in the 18th century, to regain some territory. However, the Ottomans have also had to contend with a Russian hostility, and by the Treaty of Kucuk Kaynarca (1774), Russia has won the right to protect the interests of the Orthodox population within the Ottoman empire. In the Balkans, the people have been increasingly agitating for national liberation. In Serbia, a rebellion in 1815 succeeded in driving the Turks from much of the north. Under the threat of renewed Russian intervention, the Turks granted the rebels a semi-autonomous principality. Further south, in Greece, an uprising broke out in 1821. A wave of sympathy for the Greeks swept through Europe and Russia, France and Britain sending support. The ensuing war ended in Greek independence and confirmed the autonomy of Serbia. In the Balkans, the increasing weakness of the Ottoman empire has been drawing the European powers into the region, even more than before. This, however, has exposed tensions between them. Each wishes to benefit as much as possible from the situation, but is increasingly suspicious of the others’ motives. These tensions helped lead to the Crimean War (1854-6) between Britain, France and Turkey, on the one hand, and Russia, on the other. Russia came off worst, and was forced to give up the right to protect Christians within the Ottoman empire, as well as some territory, which reverted back to the Ottomans. The Treaty of Berlin (1878), signed by the leading powers of Europe, recognized the full independence from the Turks of Serbia and Romania, and guaranteed self-government for Bulgaria within the Ottoman empire. Bosnia, whilst theoretically remaining a part of the Ottoman empire, was to be administered by Austria-Hungary. The Austro-Hungarian occupation would leave a lingering thirst for independence. Bulgaria was given complete independence from Turkey in 1908. In 1912-13 Serbia, Bulgaria and Greece drove the Ottomans out of most of their European territories in the First Balkan War – but then fought over the division of the conquered Ottoman territories in the Second Balkan War (1913-14 – this allowed the Ottomans to reclaim some of their lost territory). In all this upheaval Albania declared its independence. The aftermath of World War 1 saw the map of the Balkans re-drawn. Most notably, Serbia, plus the South Slav territories of the former Austro-Hungarian empire, were united to form the kingdom of the Serbs, Croats and Slovenes, later called Yugoslavia. Because of the inability of the various national groups to work together, the king, Alexander I, established a dictatorship (1929). The period of World War 2 saw all the countries of the region occupied by the Axis powers. Communist-led resistance movements sprang up, and, aided by the incoming Soviet forces, won control of most of the countries after the war. Bulgaria and Romania became members of the Warsaw Pact in 1955, whilst Albania and Yugoslavia, under its president Josip Tito, retained a much more independent stance. Greece is the only Balkan country not to have fallen under communist sway. Greece is a constitutional monarchy, and a member of NATO. In Yugoslavia, the death of Tito (1980) gravely weakened communist rule, and the waves of liberation washing over other parts of the communist world in the late 80’s and early 90’s led to the dissolution of the country. Croatia, Slovenia, Serbia and Montenegro, and Macedonia, all became separate states. So too did Bosnia, which quickly descended into civil war between the different religious groups. This drew in Serbia and Croatia on opposite sides, and eventually, when fighting flared up in Kosovo, NATO stepped in with a bombing campaign (1998). Since then, although plenty of tensions remained in the region, full-scale war has been avoided. The other countries of the Balkans threw off their communist regimes in 1989 and the following years; all have gradually moved towards becoming multi-party democracies. They have all experienced economic hardship, but over time things have improved.